We will be having our next patching circle on Sunday April 6th starting at Noon, at CRASH Space (10526 Venice Blvd., Culver City, CA 90232 – view map). This event is free and open to everyone. There will be a special guest: Chris McCormick, musician and creator of PdDroidParty and WebPd, will be joining us (all the way from Australia) and showing us what he has been working on lately. 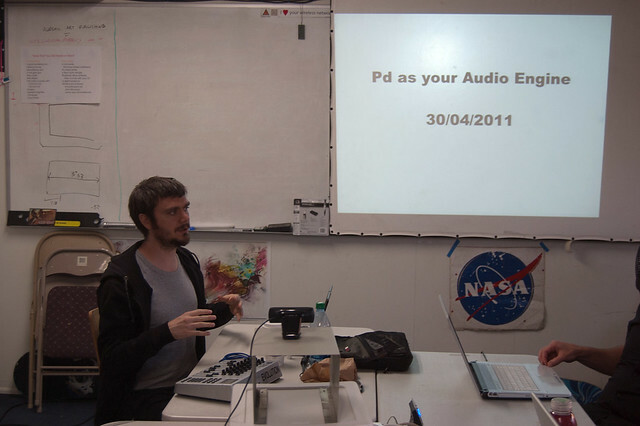 Chris visited a few years ago and taught a workshop on using Pure Data as an audio engine with other languages. What is Pure Data (Pd)? Pd is an open source visual programming language used by artists and musicians all around the world. It’s creator, Miller Puckette, teaches computer music at UCSD, and was the creator of the original version of Max/MSP. A patching circle is an informal gathering of anyone who is interested in patching languages (Pure Data, Max/MSP/Jitter, etc.). Beginners and experienced patchers are welcome. Open to everyone – work on personal or professional projects, school work, or just patch quietly to yourself, in a room full of other people patching patches and helping other people patch. There is a last minute venue change for the patching circle this Sunday. The patching circle will take place at CRASH Space from 3-8 PM, following MakerBot Monthly. CRASH Space is located at 10526 Venice Blvd., Culver City, CA 90232 – just north of STAR Education. From Noon to 3 PM (ish), Miller and our workshop instructors will be hanging out at the Crowne Plaza Airport Los Angeles (in the lobby unless they are able to get a room to use), and you are welcome to join them there prior to starting up at CRASH Space. The Crowne Plaza is at 5985 W Century Blvd, Los Angeles, CA 90045. If you are interested in 3D printing, you are also welcome to come to CRASH Space early and see the 3D printing action. So come by CRASH Space at some point Sunday afternoon and see what’s going on. Information is all up on the CRASH Space blog, so I haven’t posted about this here, though I should have. This weekend, 16-17 November, CRASH Space and New Blankets are hosting PdWeekend, a series of workshops, a patching circle, and Handmade Music 4.0. Saturday 11/16, we have FOUR workshops with special guest instructors. Miller Puckette, creator of Pure Data (Pd) will be showing the latest tips and tricks for using Pure Data on the Raspberry Pi. Katja Vetter will show how to build a quality unidirectional DIY microphone suitable for live recording, and how to use it with Slice//Jockey, a live sampling Pure Data patch. Ico Bukvic will teach a workshop appropriate for ages 10 and up covering an introduction to Pd-L2ork interactive visual programming environment and its K12 eduction module. Unlocking Computer Creativity for musicians and creative types using the Pure Data programming language for a minimum of cryptic code and other off-putting digital peculiarities. Each workshop is three hours long and costs $75 (except for the microphone workshop, which has a $5 materials fee). CRASH Space members receive discounts on workshop fees (see members list for details). Saturday night (5:30 – 9:30 PM), we will be having Handmade Music 4.0, with performances by our guest instructors and local musicians. FREE! Sunday afternoon (4 – 8 PM) will be our special patching circle with our special guests, featuring performances and demonstrations, as well as the usual patching. FREE! Tickets for the workshops, and RSVP for Handmade Music and the patching circle are available at the CRASH Space Eventbrite page. The workshops and Handmade Music will be taking place at STAR Prep Academy, 10101 Jefferson Blvd. in Culver City. More information about location and parking are on the CRASH Space blog. On Sunday, October 7th from 3-7 PM, Miller Puckette, creator of Pure Data (Pd), will be showing how to use Pd on the Raspberry Pi. Pd is an open source graphical audio/video programming language used by musicians and artists all around the world, and now it can be used on the $25 Raspberry Pi! This event will be held at the Culver City Veterans Memorial Building, located at 4117 Overland Avenue, in the Uruapan Room. The location is just a few blocks away from CRASH Space. There will be a reception with snacks at CRASH Space following the event. We will cover Pd basics, installing and using Pd on the Raspberry Pi, and show some examples of what can be done. Each student will receive an 8 GB SD card containing Raspberian wheezy Linux with Pd already installed. No experience is necessary. Bring a computer (laptop or netbook) to communicate with the Pi, and headphones or computer speakers. We will have some speakers and a monitor set up for people to share and try out their Pi. For those who do not have a Raspberry Pi yet, there will be kits available with a Raspberry Pi, power supply, and an Ethernet crossover cable (for connecting to a computer). There are a limited number of scholarship seats available to teachers and students – contact theron.trowbridge@gmail.com for more information. The videos of Miller Puckette’s MUS 171 class have been posted and can be downloaded from the media page. There is also a transcript of the videos. Right now it’s just a plain text file, but we’re working on indexing it, converting to other formats, and translating to other languages (Spanish is first). Next week’s pd-LAunch II events will be held at CRASH Space – 10526 Venice Blvd, Culver City, 90232. Full details on the pd-LAunch II page. The next pd-la patching circle will be on Sunday 13 May 2012 from 12-5 pm, at CRASH Space (10526 Venice Blvd., Culver City, CA 90232). As part of pd-LAunch II, we are planning on having some special guests. Stay tuned for more details. The patching circle is an informl gathering of anyone who is interested in patching languages (Pure Data, Max/MSP/Jitter, etc). Beginners and experienced patchers welcome. Open to everyone – work on personal professional projects, school work, or just patch quietly to yourself, in a room full of other people patching patches and helping other people patch. Open and free to all (donations to support CRASH Space are encouraged) – come and bring your Pd, Max/MSP, and other noisy programming project to work on. pd-LAunch II will take place May 12-20 at CRASHspace, UCSD, and venues throughout California. The week of workshops, talks, performances, and patching circles will be bookended by Handmade Music L.A. 3.0 (May 12) and Maker Faire San Mateo (May 19-20). The schedule is still tentative, and being formulated. There is a pd-LAunch II page where the schedule of events will be updated as they are firmed up. Peter’s workshops were great. Lots of people showed up and got to see the Processing/Pd library for the first time. This month we have two events with Peter Kirn of Create Digital Music. 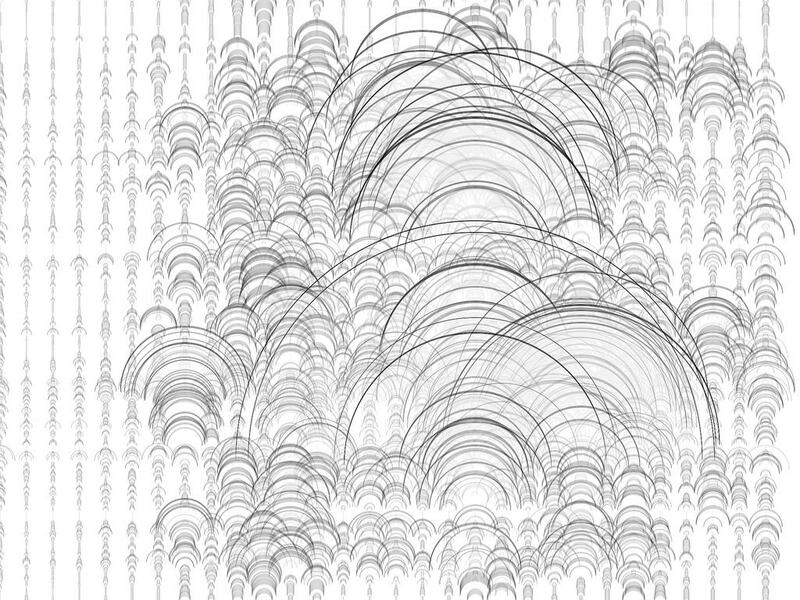 Peter will be teaching a workshop about using pdlib within Processing, on Thursday Septenber 8th from 7-10 pm. Due to high demand, a second workshop has been added on Saturday September 10th from 6-9 pm. Limited space, $60. Sign up in the store for Thursday or Saturday. Make your own instrument, sequencer, or effect, then give it a visual interface – not just fake knobs and buttons, but via any picture you desire. Now you can, with two integrated tools, entirely for free. 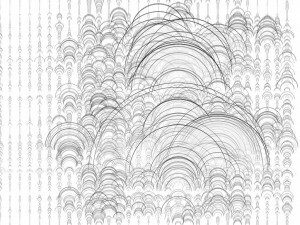 Using Processing, the artist-friendly rapid code “sketching” environment, and Pure Data (Pd), the visual patching tool, we’ll discover how to create custom music creations entirely in free software. Starting with simple projects, you’ll learn how to get up and running to create your own tools, see some of the basics of how to make visual interfaces in Processing and construct musical tools with Pd, as well as how to route audio from these into software you already use like Ableton Live. Via the new free libpd library for Processing, developed by Peter Kirn and Peter Brinkmann, you can use Pd patches right inside Processing. You create your musical creations – sequencers, drum machines, synths, effects, and so on – using the graphical environment Pd, which uses patch cords to represent the flow of signal through your sonic rigs. (A library of useful building blocks means you can construct all kinds of powerful tools even without much Pd knowledge.) Then, in Pd, you can create graphical interfaces via lightweight code, which can even run on your desktop or even mobile phones and tablets powered by Android. We’ll experiment with some simple two-dimensional and three-dimensional generative graphics for visualizing and playing our instruments, and some useful tools (a synth, a drum machine, a pattern maker, an effect you can use with a mic). See the full description in the store. On Sunday, September 11th, starting at Noon, Peter will join us for the monthly Pd/Max/MSP patching circle. Bring your project from the workshop, or any other project you’re working on. This is also a good chance to learn more about Pure Data (Pd) or Max/MSP. The patching circle is open and free to all.